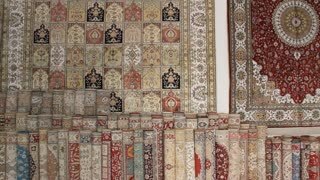 Production of fabrics. 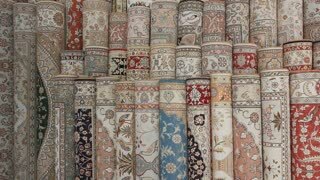 Raw materials for textiles. Textile Factory. Drying the filaments. 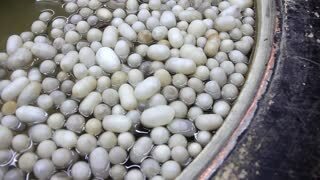 boil silkworm cocoons shell. An important economic animal in the production of silk. 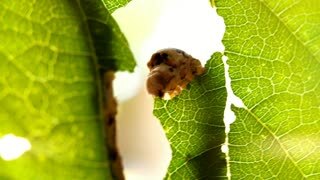 Silkworm eating a mulberry leaf. An important economic animal in the production of silk. The golden yellow silk thread is exposed on the bamboo rail. A woman turns a wooden spindle to extract small silk strands from yellow silk cocoons; close up on the spindle; static shot. 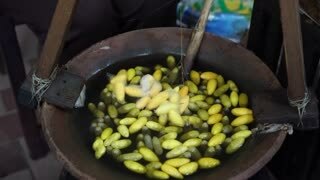 A woman boils yellow silk cocoons and extracts small silk strands using a wooden spindle; close up. Close up of yellow silk thread being drawn up onto a wooden spindle by an expert silk artisan; static handheld shot. A woman handles a small yellow silk cocoon so that she can extract the silk thread and collect it on a wooden spindle; pan down to boiling pot from woman; close up. 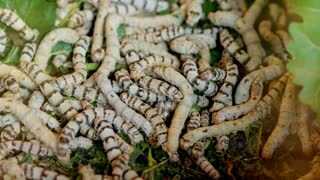 Boiled silkworm cocoon to separate threads. A small tree tangled in cobwebs. The cobweb is created by insects-silkworm caterpillars. Insects (pests) killed a tree. Cobweb glistening in the sun. Sunny evening in the forest. A giant silkworm moth (Lonomia sp., family Saturniidae). Members of this genus are known for their caterpillars which produce a highly potent anticoagulant venom. In the Ecuadorian Amazon. Two giant silkworm moths (Lonomia sp., family Saturniidae). Members of this genus are known for their caterpillars which produce a highly potent anticoagulant venom. In the Ecuadorian Amazon. Close up of a silkworm chewing on a green leaf. 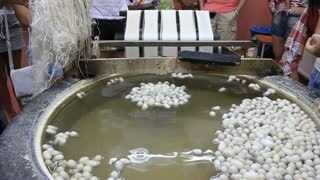 Woman boils silkworm cocoons and makes a silk thread. 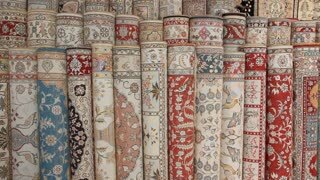 Traditional asian fabric manufacture. Thailand.